Garichico was one of the worst affected areas, with waves crashing over the sea wall and flooding streets to the astonishment of locals who filmed the water racing towards them as they ran for safety. Further south, in the holiday hotspot of Adeje there were also reports of waves breaking the windows of a hotel restaurant, although again there were no injuries. The first evacuations were carried out around 10 pm on Saturday night, with more following around 2 am. Many of the homes evacuated in Mesa del Mar are holiday homes. It is not known if any Brits were among those asked to leave their apartments, although the town is popular with holidaymakers and has two natural swimming pools which are a big draw with locals and day visitors. Parts of Malaga were also hit by heavy downpours with Mijas, Ojen and Coin all badly affected. 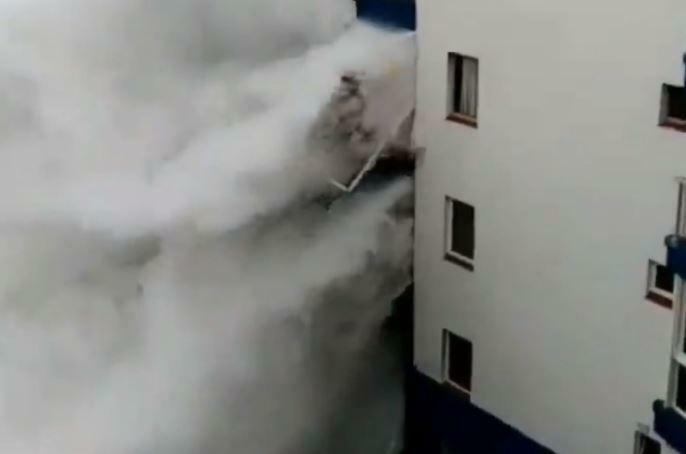 Hotel Playa in Las Chapas caught fire after it was hit by lightning.